Finding the right family car can seem like a daunting process – especially with such a wide array of sedans, SUVs, and minivans available from both domestic and foreign manufacturers. Though the selection is large, the best options are easy to find. If your family is in the market for a new car, four options stand out among the many, varied competitors from today’s largest automakers. Kia may be widely regarded as the best value brand in the automotive industry, but this reputation does a disservice to the company’s overall commitment to quality, safety, and luxury amenities. A case in point is Kia’s 2016 Optima. With a slightly refreshed design, the midsize sedan is looking sportier than ever. Inside, however, the car screams “family.” The company has retooled its Kia UVO infotainment system with a larger screen that offers vehicle diagnostic integration, CarPlay and Android Auto features, and full Bluetooth control of portable devices. The system is perfect for long trips with a family that demands entertainment. On the road, the 2016 Optima is an economical choice for families who only need a 5-seat sedan. The car gets up to 39 miles per gallon in highway driving, a number that used to be reserved for subcompact options like the Kia Rio. LED headlights, fog lights, and taillights illuminate the road more effectively while saving energy, and the panoramic sunroof option provides a nice amount of cabin lighting and upscale design. Overall, Kia’s 2016 version of the Optima stands out as the single best sedan for families that like to be comfortable, safe, economical, and entertained. Given rave reviews by the likes of Edmunds, U.S. News and World Report, and Kelley Blue Book, the 2016 Mazda CX-5 continues a Mazda tradition of creating comfortable, spacious crossovers that are designed to go the distance. 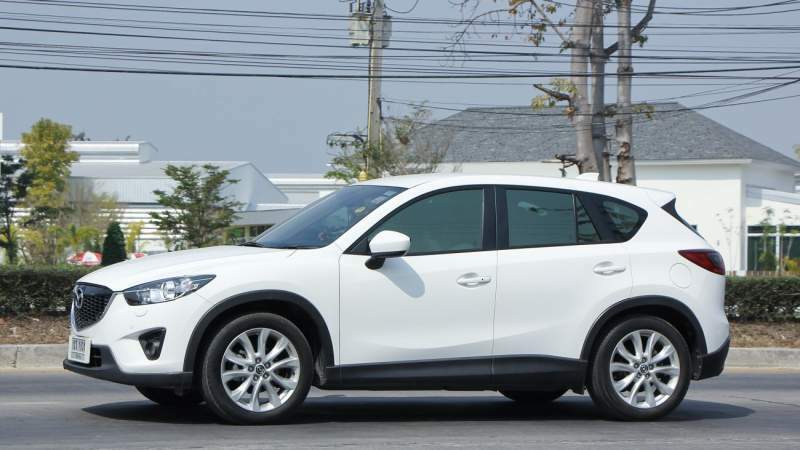 This year’s version of the CX-5 crossover features a slightly refined design, with a new front grille, a slightly redesigned set of headlights and taillights, and new alloy wheel options. Inside, the redesign sees the addition of the Mazda Connect infotainment unit. Previous models didn’t have the telematics system, and lacked a large enough screen for smartphone integration, but the problem has been solved this year. The CX-5 features two rows of seating and a maximum passenger capacity of five individuals. Front and side airbags contribute to safety, while a 36-mpg highway fuel economy rating ensures that families can upgrade to a crossover without upgrading their fuel budget. The crossover features up to 65 square feet of cargo space, depending on seat configuration, which makes this model perfect for hauling small families and their gear to various school and sports events all year long. Some families need to go beyond the two-row seating of a compact SUV like the Mazda CX-5, and that’s where the Honda Pilot really excels. Known for being one of the largest SUVs currently on the market for American buyers, your family will enjoy access to three rows of seating and a maximum passenger capacity of eight people. In addition to this excellent capacity for hauling the kids and their friends around, Honda advertises the Pilot as having up to 85 square feet of cargo space when the rear seats are collapsed. Even without its third row, the full-size SUV can haul five passengers and enough sports gear for the whole family. Perhaps the most remarkable achievement in the Honda Pilot’s list of features is its fuel economy. In previous years, full-size SUVs were derided as some of the worst on fuel economy. This model year, the Pilot gets 20 miles per gallon in city driving and an impressive 27 miles per gallon in highway driving. That’s more than most competitors in this segment can offer. The interior of the car features either cloth or leather seating, a full-size infotainment display with CarPlay and Android Auto support, and telematics that help to diagnose common engine problems or other technical issues. An automatic transmission, along with a powerful engine, ensures that the ride is smooth and easy to control. Honda’s trademark focus on interior noise isolation also provides for a quiet drive, making it easy to enjoy the entertainment experience provided by the HondaLink infotainment center. If your family really values cargo space and the flexibility to either add or remove seats, the Toyota Sienna is the right choice. The minivan, ranked a best value by U.S. News and World Report, has just under 40 square feet of cargo space with all three rows of seating in use. Fold down a few seats, however, and the interior cargo room is expanded to a massive 140 square feet in just a few minutes’ time. There simply aren’t many other options among minivans that allow this type of flexibility. Cargo room isn’t the only area where this model excels, however. Inside the cabin, Toyota has created the best possible experience for high-tech families. If your kids enjoy taking a smartphone or tablet along for the ride, the Sienna has just the right amenities. Auxiliary power jacks are available for all three rows of seating, providing ample room for car chargers and USB cables. In the front, USB and auxiliary audio capability are integrated into the Toyota Entune infotainment and telematics system. Bluetooth connectivity is also offered with even the base model, making the Sienna a great choice for techie families. With five different trim levels and plenty of options, the Sienna also specializes in value and customizability at the time of purchase. The market for family cars, SUVs and minivans feels almost endless, with dozens of midsize and full-size sedans, crossovers, full-size SUVs and minivans. Despite the wide selection, however, the four cars mentioned here are easily the best for today’s families. These four cars all have a few things in common: cargo space, flexibility, value, excellent fuel economy, and a technological ecosystem that’s compatible with today’s high-tech kids and their parents. For longer trips, any of these four cars will keep the family happy, entertained, and safe.